“We are writing this letter in view of your recent initiative aimed at curing diseases during the lifetime of our children. The Chan-Zuckerberg Initiative is not only a dynamic, revolutionary and bold idea, but it also promotes inspiration and optimism in the hearts of an entire generation of people by encouraging them to think, aim and strive to reach bigger things. Curing all diseases might seem impossible now but what the future holds, seems promising now. The very thought of making the future a better place for our children to live, is a massive achievement in itself. We applaud this ground breaking endeavour. The 21st Century has not only led to amazing medical breakthroughs but has also contributed to widespread and unchecked pollution in general. Our aim is to remind all of us that solving the environmental pollution and curbing the rampant adulteration of food is fundamental to building healthy communities and preventing diseases, which is part and parcel of the Chan Zuckerberg initiative. As tremendously rewarding the mission will be, with its innovative scientific achievements and breakthroughs for curing diseases, we hope that there is enough attention is given to tackling the basic issues of pollution and food adulteration. Now why should we be discussing about pollution and food adulteration? Because prevention is always better than cure! A lot of the modern diseases can be prevented by addressing the above issues. Even if we find cures to these diseases, if pollution and contamination prevails at current levels, our kids are going to keep falling sick over and over again until we come up with something so-spectacularly-amazing that our kids will stay immune to all sorts of diseases despite breathing the stale air and eating the contaminated food. Or else, the vicious cycle will continue. Tackling the aforementioned issues will require the individualistic effort of every citizen on this planet and the onus doesn’t particularly lie in the hands of an elite group of individuals. Whilst the scientific community engage in finding cures for diseases, the general community and community leaders can work together to ensure that pollution and food adulteration are curbed. Individualistic efforts will yield more sustainable results.This two way strategy, perhaps, is the only way to eliminate, eradicate all the diseases. Because, not every one can afford organic food and air purifiers. Because investing in mother earth is the only way to save our future. We are sure that most of us will agree that there were only very a few instances of us getting sick whilst growing up. But kids these days are burdened with the affair of having to deal with all sorts of viral fevers, stomach bugs, infections, breathing difficulties, cancers and what not. Parents, teachers and educators complain about how frequently our kids are falling sick. Growing up is a struggle in itself. The children in our cities are struggling. It is an ongoing- every day struggle for the children and parents alike. We don’t have to be scientists to realize that pollution coupled with food adulteration is perhaps the greatest concern contributing to the ill health of our kids. To put it in simple words, there is poison in the air that we breathe, poison in the water that we drink and poison in the food that we eat. Children growing up in such conditions are prone to a petri-dish of allergies and related diseases. They are the ones who suffer the most due to their weaker immune system, as a result of which, pediatricians and emergency units are being flooded by such cases. Investing in big technology with Engineers and Scientists may be the solution to possibly curing a large number of diseases, but if these external factors are not taken into consideration, it will only lead to futile efforts. We are sure you know this better. We only want to offer a gentle reminder that these two issues are the key to the “prevention” of all diseases, as they play a humongous role in contributing to the vicious cycle of deadly illnesses, disabilities and disorders. How many times have we looked out of our window to see dust clouds instead of luminous stars, hear the constant drilling noise instead of melodious chirping of birds and breathe in obnoxious airborne toxins instead of a fresh, clean air? Things like water and air purifiers are becoming more and more of a necessity only due to such forms of pollution and efforts should be made to nip them in the bud permanently. It’s time we start thinking of giving our children the very best future we possibly can, by eliminating such poorly managed processes so that they too can live and grow to be healthy adults in their later lives. Some changes are good. But many others make us silent witnesses of painful transformations. What today’s childhood experiences is one such. Here are a few snapshots of how I see my childhood as different from that of today. Berries on the way to school. Sweet berries spreading crimson on hands and tongues. Two varieties of mulberries. Guava trees around the farm. Mangoes of a hundred variety. Jackfruits. Then pineapple, tamarind, gooseberry, and a hundred other provincial fruits whose names probably don’t even exist in English! Seasonal roots and vegetables. Hand-drawn sweet water from wells. Nutrition from the nature. Something today’s ‘spoon-fed’ kids don’t have! Fruits dipped in pesticides, vegetables modified genetically and drinking water processed from reservoirs would be a poor shadow of what we had. 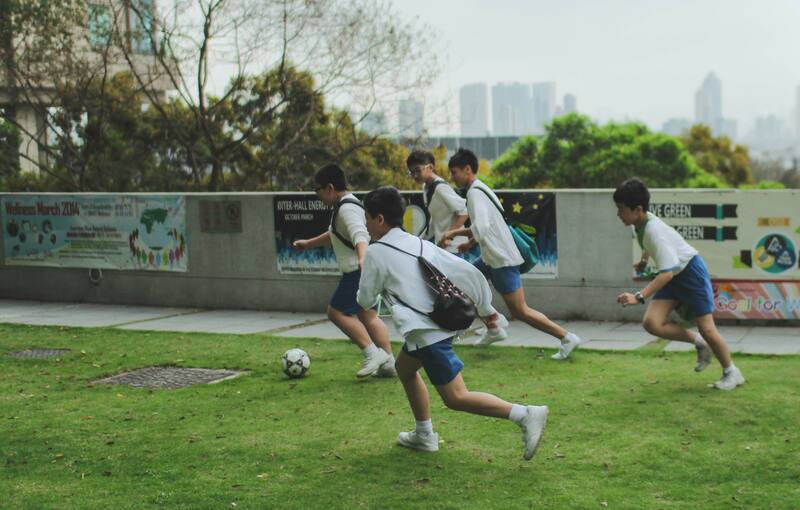 Games in the school playground. Officially once every week and unofficially all days! Football, cricket, relays, races, long and high jumps. A lot of running, kicking, falling and crying. Injuries that made us strong. Little scars here and there on little limbs that remind us of sweet sweaty friendships of the past. Physical exercises. Something today’s ‘disciplined’ kids don’t have! Perfectly simulated computer games, eternally complacent TV rooms and virtual friends who pop up on tiny LCD screens would never equal the vibrancy of the playful childhood of the past. Siblings to fight and share with. I had three others in the house to bet, compete, fight, share with and to love. Some fights were bitter and bloody, but some were equally lovely. It’s there that I learned that life is not always fair. That I don’t always get what I wish for. That others are equally important as I am. That I need to share things and feelings to be happy. Training in social life. Something today’s ‘single’ kids don’t have! Needless to say, lone childhoods in the company of busy parents with no grandparents around will not foster a selfless, sharing and caring generation. Life today is very different. My children will never have this ambience to grow up in. And that affects the general health of the growing-up generation. Allergies, phobias, obesity and lifestyle diseases have grown into childhood. A scary future! Hello admin !! I read your posts everyday and i must say you have hi quality articles here.